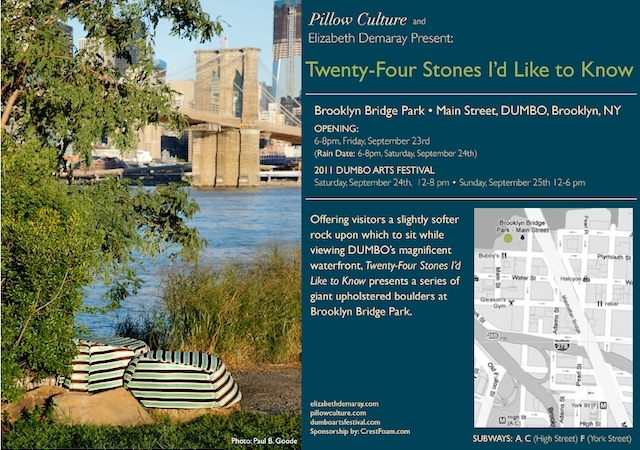 Offering visitors a slightly softer rock upon which to sit while viewing DUMBO’s magnificent waterfront, Twenty-Four Stones I’d Like to Know presents nine giant upholstered boulders in Brooklyn Bridge Park. 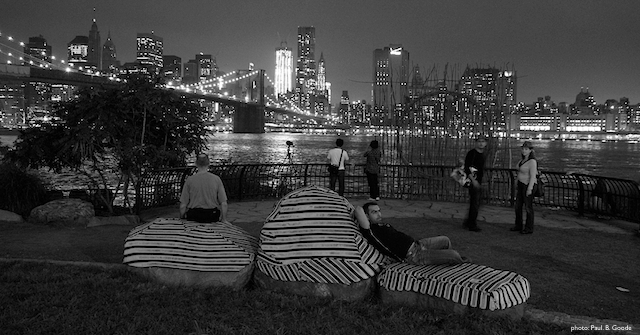 On view as part of the 2011DUMBO Arts Festival, this project is the brainchild of artist Elizabeth Demaray and Pillow Culture. 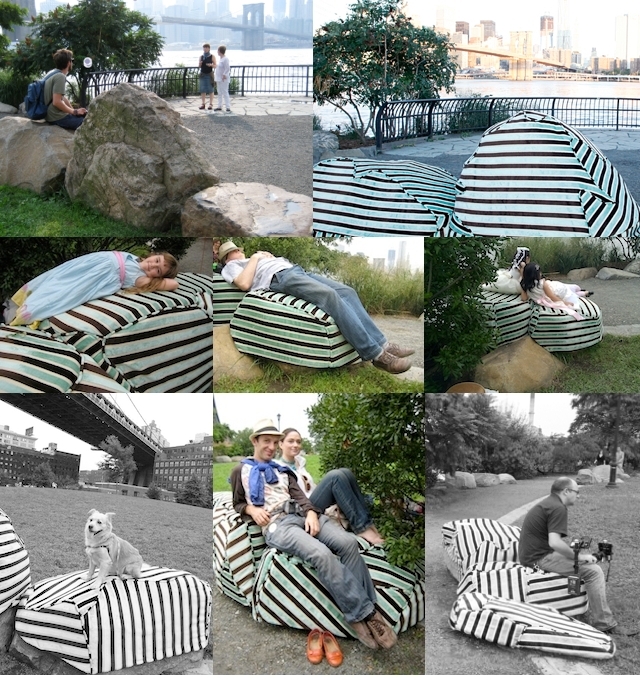 Each stone sports it’s own uniquely fitted cozy-style covering in plush striped fabric and EZ Dri® outdoor reticulated foam. Twenty-Four Stones asks the age old question: can you ever make a stone any softer? Through this unlikely marriage of materials, Twenty-Four Stones considers the relationship between monumentality and comfort via a familiar object – the pillow. In this unique project, Emily Stevenson and Natalie Fizer of Pillow Culture will be using each rock pattern as a template to re-construct the underlying boulders in order to generate a geometrized version of each stone. Acting as prototypes, each stone will be re-created as part of a limited edition in their Mega Pillow series. Pillow Culture, co-founded by architects Emily Stevenson and Natalie Fizer, is dedicated to promoting the pillow. Using current material technologies, Pillow Culture designs and produces, as well as collaborates with artists to create innovative limited edition pillows that relate to human comfort, beauty, and well-being. New York artist Elizabeth Demaray knits sweaters for plants, fabricates alternative housing for hermit crabs and famously familiarized a 10-ton Nike-Hercules Missile by upholstering it in 400 sq. ft. of satin. Thank you to our sponsor Crest Foam for their generous contribution of EZ Dri® outdoor foam.